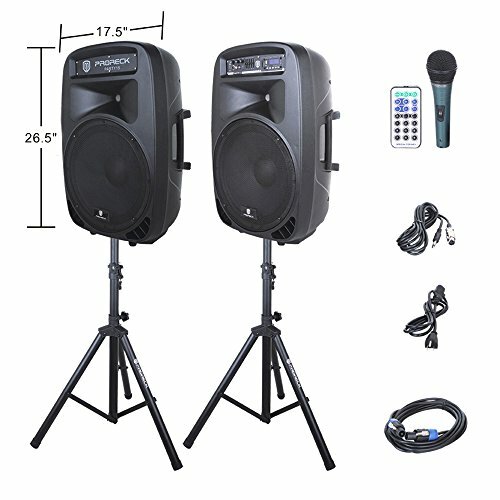 Our 9-piece PA system, with which you can easily enjoy the powerful sound, is composed of an active speaker, a passive speaker, a microphone, a wireless remote control, a 30ft length speakon cable to connect the passive speaker to the active speaker, a power cable, a microphone cable as well as 2 speaker stands. This all-in-one set is a great choice for DJ, anniversaries, backyard weddings, home studios, speech, social gatherings, etc. You can connect the passive speaker to the active speaker through the speakon jack and mount the units to the 35-mm speaker stands for a wonderful sound experience. In addition, the built-in LED lights with 4 colors provide a brilliant light show for your party. The PARTY 15 is equipped with 1/4'' Mic Input for an unbalanced Mic, RCA Line inputs and output as well as speakon output. These connecting options can fully meet all your daily demands. With two transport wheels at the bottom and side handles for easy carrying, you can easily move the speaker anywhere you want with only a little effort. This 15 inch PA system with rugged ABS plastic injection enclosure has a 200 Watts RMS and 2000 Watts P.M.P.O output. The package dimensions are 31" × 19" × 30" (W x D x H) with package weight of 86 lbs.